A pair of Smartphones and a SIM. Whilst in Ireland, you have three options to consider regarding keeping in touch via your mobile phone. You can opt to use your existing cell phone, though you will inevitably incur high roaming charges. Alternatively, you can either can buy an Irish SIM for your existing iphone or a new basic model to use for the duration of your stay. While you do have the option to use your current mobile phone on your trip to Ireland via the roaming plan offered by your provider, this could be very costly indeed in terms of roaming charges, particularly if you are travelling from outside the EU. Therefore it makes sense to shop around for a more affordable solution such as an Irish SIM card for your cell phone or a prepaid / pay-as-you-go SIM card and handset. Purchasing an Irish SIM card or handset is an ideal way to avoid sky-high roaming charges. There are four main cell phone network providers in Ireland: Meteor, Tesco Mobile, Vodafone and Three (please be aware that O2 was merged into Three Ireland in March 2015). You’ll find that 3G and 4G is readily available as a network standard in Ireland. While all the main networks do offer a 4G mobile phone option. This service may not be accessible by customers on a prepaid / pay-as-you-go cell phone or using a temporary Irish SIM card. Don’t worry though pretty much all bars and hotels will have wifi access. One main benefit of using an Irish SIM in your phone that incoming phone calls are free of charge on all of the Irish mobile mobile networks, irrespective of where the call may have originated. 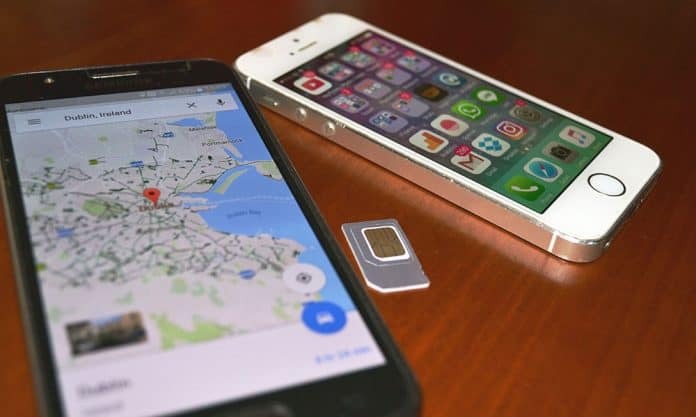 This means that with an Irish SIM in your phone, calls from friends and family, regardless of where they are located in the world, can be made without your paying a penny. Mobile operators in Ireland have made the purchasing of data packages a very simple process. Most tourists and travellers will find it invaluable to have access to the internet on their travels, so this is a definite benefit. You will need to purchase an Irish SIM. You can pick them up from Dublin airport (or any other) when you land. One good option is to get a pre-paid card, as this helps you to set the phone budget for your trip in advance. Cards of this type are widely available across the country from retailers, including Tesco supermarkets. Lots of other shops stock them too, including newsagents and corner shops. A 50-euro card should be sufficient to cover you for a fortnight. When you purchase an Irish Network SIM pack, you will automatically be allocated a pay-as-you-go account. This makes things nice and simple, as there is no contract or credit check required and no upfront or minimum payments either. Once your phone is unlocked and ready to go, you simply fit the SIM and you’re done. Remember to put your main SIM in a safe place so that you can easily switch back to it once you’re back at home. The cost of your new Irish SIM is likely to be low or, in some cases, free. How much you need to pay will vary from provider to provider, so it can be worth having a brief look around before purchasing, though you are unlikely to find any notable discrepancies in cost. If you have an iPhone or other high-tech smartphone, the unlocking process is rather more complex. In this case, the process is called ‘jailbreaking’, and it is not something an amateur should attempt. Again, you can pay to get this done at a specialist store, but you may find it simpler, easier and cheaper to buy a cheap pay as you go phone to cover your needs whilst in Ireland. You can easily pick up a budget pay-as-you-go handset in Ireland. Tesco and other supermarkets stock them and they can cost as little as ten euros. This is a good way to avoid the possibility of racking up a large roaming-charges bill. Remember that you will have an Irish phone number for the duration of your stay, so don’t forget to tell family and friends what the new number is. If you decide to change your SIM for the duration of your trip, there are a number of factors to bear in mind. Your phone will need to be compatible with an Irish SIM card (most phones will be, but it is worth checking with your provider). Your phone will also have to be unlocked. All mobile operators lock their customers’ phones to stop them switching to a different provider, either to get a better deal at home or whilst travelling. If your phone has not been unlocked previously, your first step should be to contact the customer services team at your current provider and request an ‘unlock code’. You may be charged a small fee for this. Some providers will dig their heels in and refuse to let you have the code. Don’t despair, though, as there are ways around this. While mobile operators are allowed by law to lock the phones they sell, you the customer are at liberty to unlock your device. If your provider refuses to help you to do so (and some do tend to be quite obstructive about providing this service) there is still nothing to stop you doing it. You can unlock your phone yourself following online advice, or alternatively most independent electronic retailers are able to do it for you for a small charge. You may be asked to provide the phone’s IMEI number. This is normally located beneath the battery.